Space exploration/combat games have seen something of a resurgence recently, and one upcoming title from the genre that’s generating a lot of hype is No Man’s Sky. For those who eager to play the exploration/trading/fighting title, publisher and developer Hello Games has just confirmed the release date and announced a special edition made by production company iam8bit. The game will be launching for $60 on the PC and PS4 in the US on June 21, 2016. There’s no Xbox One version of No Man’s Sky. Gamers in the UK will have to wait a few days more to play the game as it will be available on June 24. For those who like their gaming merchandise, there’ll be a $150 special Explorer’s Edition for the PC that comes with an awesome-looking, hand-painted replica model spaceship with decal stickers. It will also include a special pin, a diorama display and “rad box.” There’ll even be an extra “mystery item” added to the set, which will be announced closer to the game’s launch. "Like all of iam8bit's products, this is a lovingly crafted package, designed to evoke a sense of space nostalgia via the inclusion of a tin toy-style ship replica. We've spared no expense to achieve hyper-detail, constructing the ship from a high-quality metal cast and then hand-painting each with precision. And much like the game, this collectible allows for a personal touch, providing an array of decals that can be applied to the ship's body," says iam8bit. iam8bit is also selling a host of other No Man’s Sky products, including a vinyl soundtrack, t-shirts, posters, prints and card sets. Developers claim that No Man’s Sky's clever algorithms have resulted in the game containing 18 quintillion procedurally generated planets. The team says that the universe is so vast, players won’t even see 99 percent of what's in it. 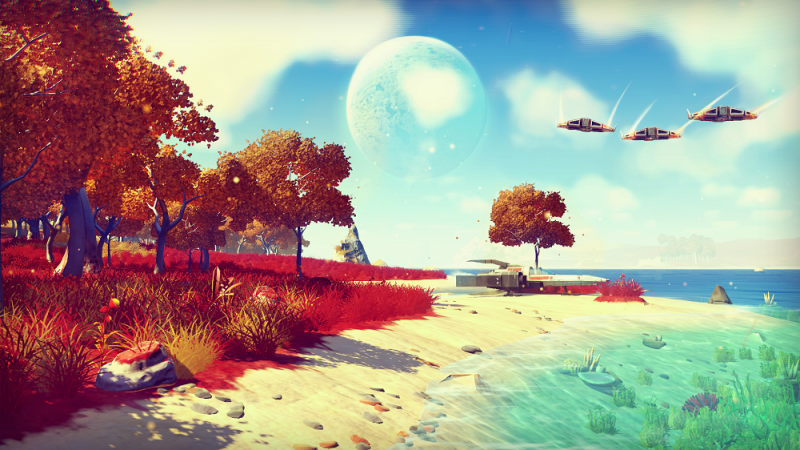 To get you in the mood for No Man’s Sky, watch the gameplay trailer below. It features Rutger Hauer repeating some of the lines he made famous in his role as Roy Batty in Blade Runner. "I've seen things..."